Happy Hump Day guys. 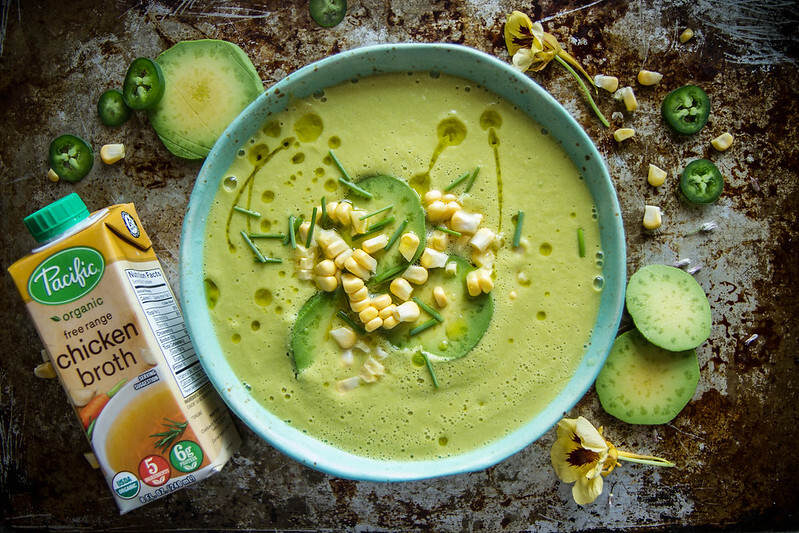 We are late into the Summer now, and I got to team up with Pacific Foods today to bring you an incredible soup that celebrates the best of the season. And I have to say, I am just dying over this soup. I’m not sure I can get over how completely gorgeous the color and texture is- do you agree?? That pale green color is amazing. I want a dress in Spicy, Corn and Avocado Soup color. I made this a few weeks ago after my family and I went Corn Picking (that was a first for me!!) in Ellensburg, WA on our Ranch weekend with friends. The kids (and maybe me) got so excited about picking corn that we may have picked about 3 times more than any of us could ever eat at one dinner. And because the kids shucked with equal excitement, we had a bunch of naked (is that what you would call it!?) ears of corn that needed to be used right away. So when I went home with a bag of it, I started thinking about all of the ways to use just picked gorgeous fresh corn. We have enjoyed corn soup like this Creamy Corn Coconut Curry Soup, Sweet Corn and Chicken Soup and Corn Sweet Potato and Lobster Chowder, but I wanted to try something different. I actually had a really rich corn bisque on the brain, but was trying to figure out an alternative option for making it really rich and creamy. Enter the avocado. So it was amazing, just as it was. But I couldn’t help but think a dash of spice would compliment the flavors and cut through the richness- and that is just what the raw jalapeno does. I garnished with some fresh avocado, raw corn kernels, garden chives and a drizzle of olive oil and it was absolutely delicious. I also think it is worth mentioning that this is really great chilled too. In a medium-large pot over medium-low heat add the olive oil and the yellow onion. Cook while stirring often for 7 minutes, and if you need too lower the heat to keep the onions from browning, do so. The onions should be soft and translucent when you add the corn kernels. Stir them into the onions and then add the chicken broth. Bring to a simmer and cook for 10 minutes. Remove the soup from the stove and transfer it to the jar of a blender. 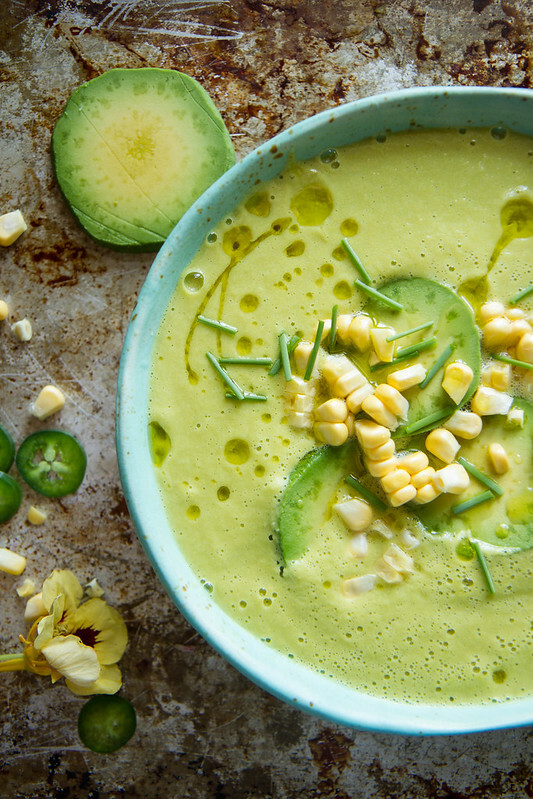 Add the jalapeno and the avocado and puree on high until the soup is smooth and creamy. Gently reheat in the same pot and season to taste with kosher salt. 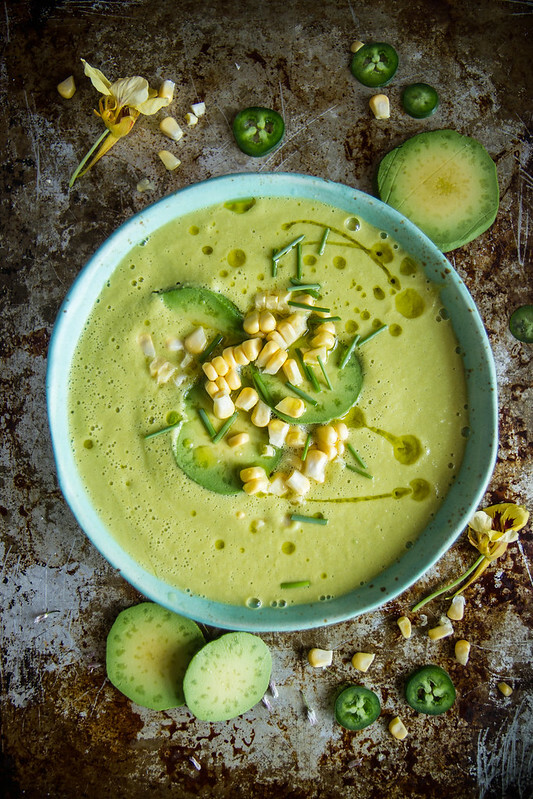 Ladle into bowls and garnished with slices of avocado and some raw corn kernels and chives plus a drizzle of olive oil. This looks delicious, Heather! Love the flavor combo and that COLOR! This is fabulous Heather!! Want!! That color! What a stunning summery soup! This soup looks wonderful! So glad I can still find fresh summer corn! Love everything about this soup! Great use of avocados!! And I love the fresh corn garnish! Great recipe, delicious. Any way to get nutrition facts? This looks really yummy Heather! I bet the flavors carry really well in the fatty avocado–as well as that jalapeno heat. I’m gunna have to try this. I’ve been makin’ a lot of your recipes of late and this one was really tasty. I added some garlic powder and poultry seasoning as well. 🙂 Avocado in a soup is magical. Next time I make cream of asparagus, I think I’ll add it in. Thank you Persephone! and what a great idea for soup!! This was just delicious. I left out the jalapeño because I don’t like heat. But I added lime juice & garnished with cilantro-infused oil. Gonna use half of the red one! Thank you so much for this. I hope it will turn awesome. Hi there. Thanks for this recipe. I tried it today and it tastes awesome!! Nice and quick. I was however unable to get the fresh green color like in your photo. Do you have any tips for me? It doesn’t reheat well. I cooked this all ahead of time and had a small bowl to try which was lovely, but unfortunately when I went to eat it the next day it was bitter. I tried this one last night. It was delicious. I think if you add some black beans and chili powder to it (and top with tortilla chips), this would make a perfect soup for anyone!